to a rental home . . . however, it was a bit challenging. We sold the sofa, sofa table with ottomans and the coffee table to the new owners. So the only sofa we had to use was the one that was previously in our master bedroom. The sofa in the media room quickly shuffled over to my son’s home. in the room where we have many, many boxes. 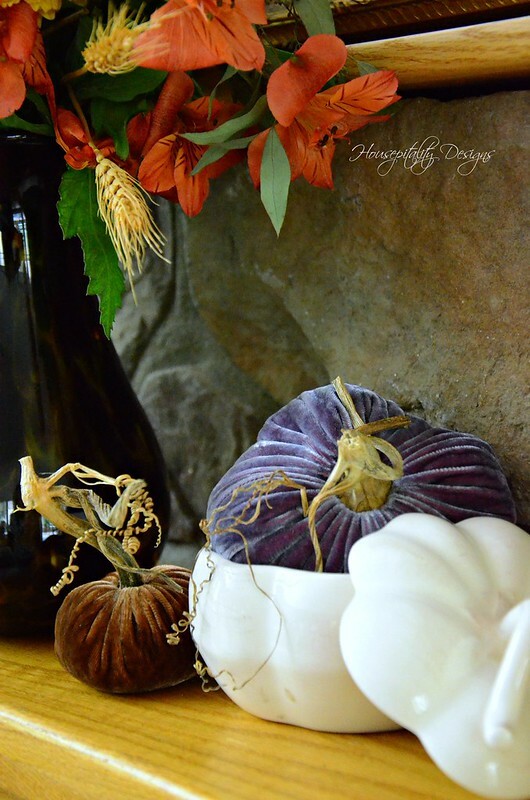 Fall decor would not be the same without them. 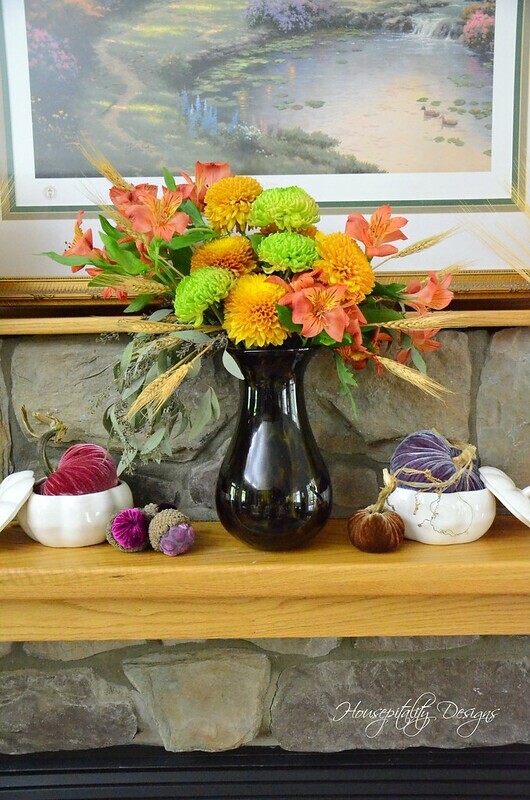 to make a simple arrangement for the Fall mantel. 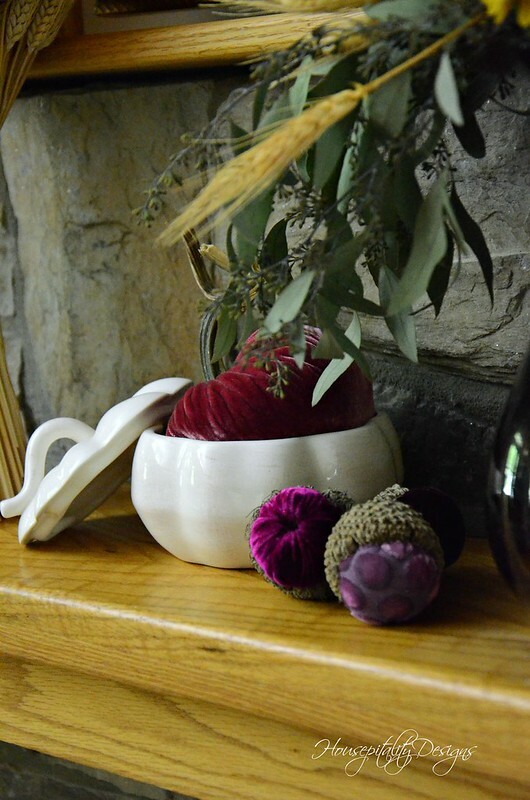 A mix of natural and faux pieces adorn the mantel. 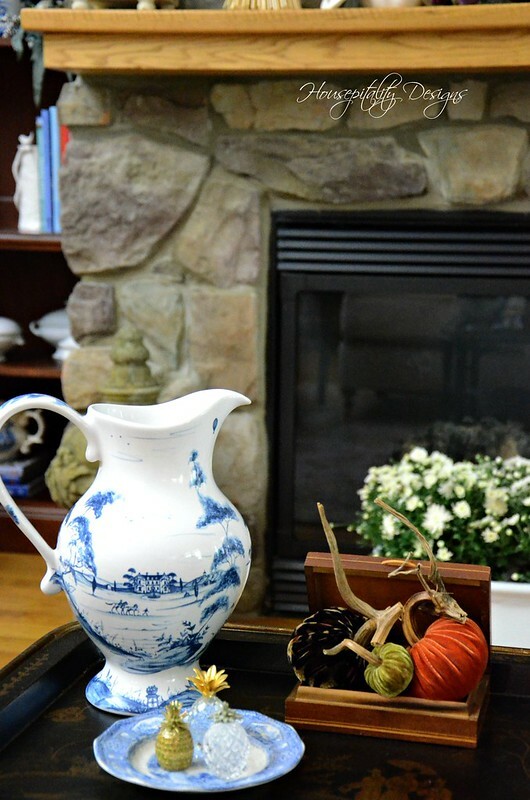 The antique ironstone foot bath filled with white fall mums sits in front of the fireplace. that was previously in the sunroom. 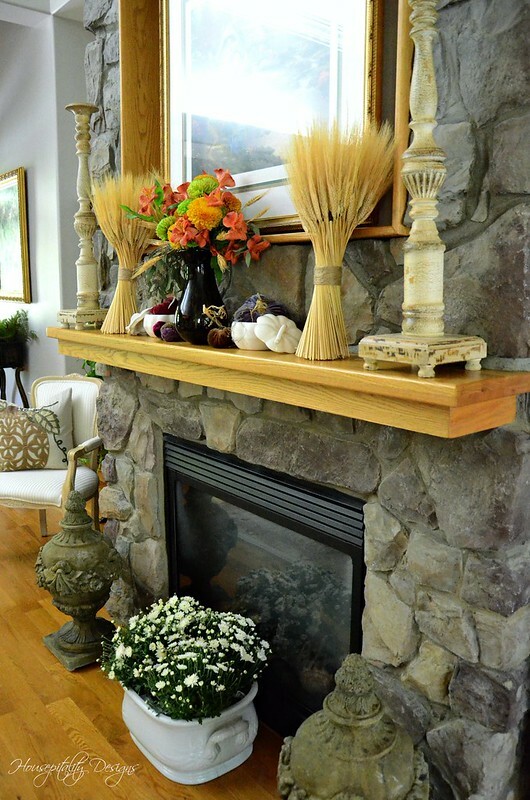 The fireplace surround has a lovely rustic feel at the Berry Patch House. A departure from our previous home. 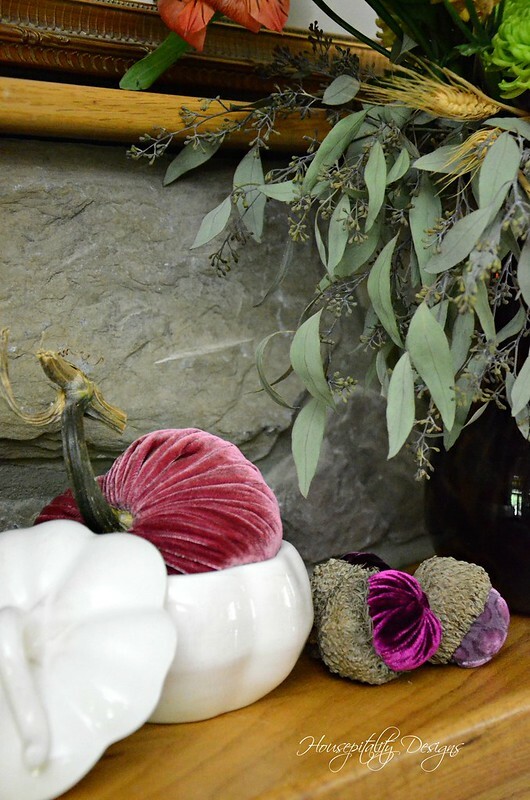 The placement of a single velvet pumpkin will dress this table for Fall. Little by little, the Berry Patch House is coming together as our temporary home. 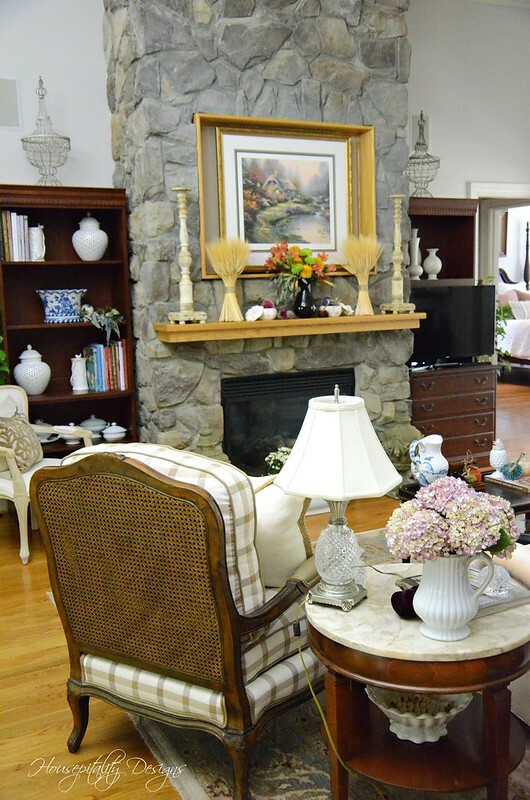 Here is a peek into the Master Bedroom and the sunroom. Those rooms are adjacent to the Great Room. Reveal coming soon. It’s officially Fall and hopefully soon the temps here will reflect that soon. Now they are playing toward achieving the title of “World Champions” …. ALSO, in my next post stay tuned for another great Giveaway! For a rental, Berry Patch Cottage is pretty cute, but then you could make any place look warm and friendly. All of your fall touches are great and I’m sure are just the beginning of what is to come. 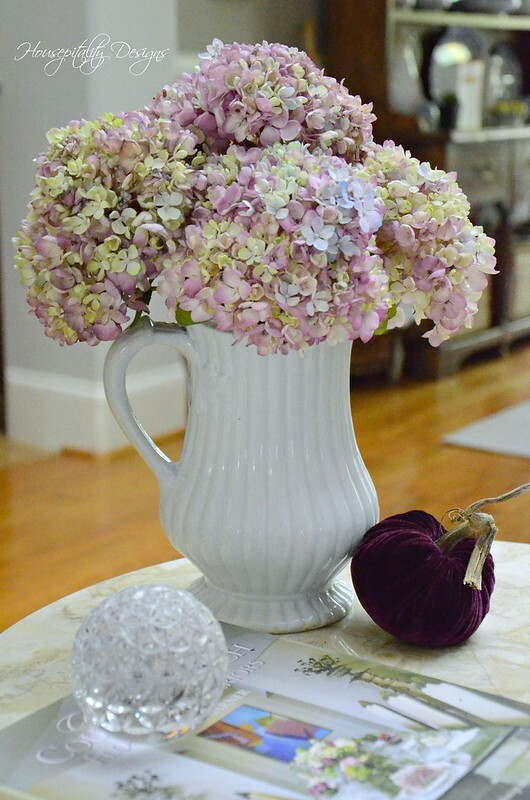 You are creating a warm and cozy home for the cooler months ahead. Can’t wait until you break ground on the new house and I love the peak of your bedroom. You are amazing. 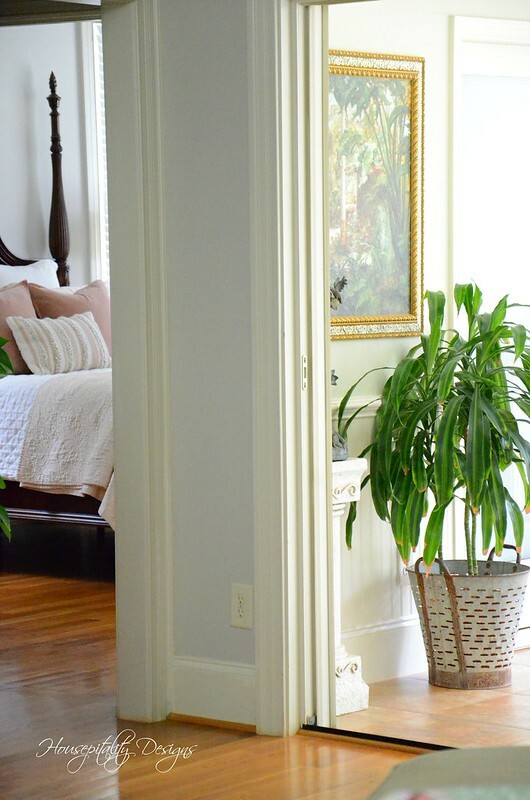 To make a rental house look and feel like your home is no easy task. When we sized down, I had a hard time deciding what to keep and what to sell. Needless to say, I sold things I should have kept. Looking forward to see what you do for the holidays coming up. 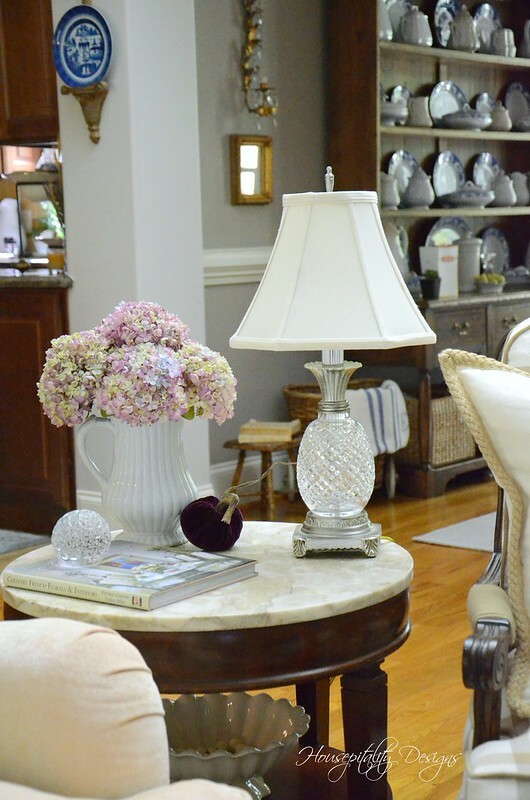 Shirley, everything looks gorgeous in your living room! 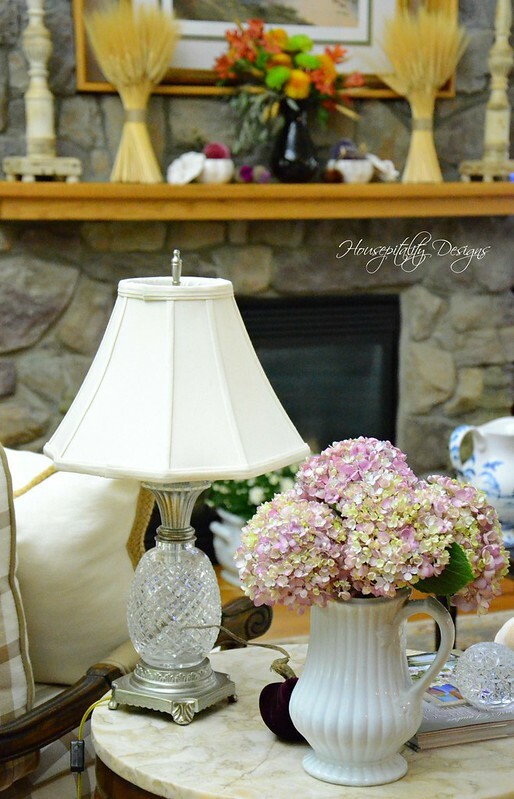 You amaze me at how your have created such a beautiful living space in your rental house! I love the rustic fireplace with your pretty decor touches. Happy Fall!!! Beautiful……absolutely beautiful! 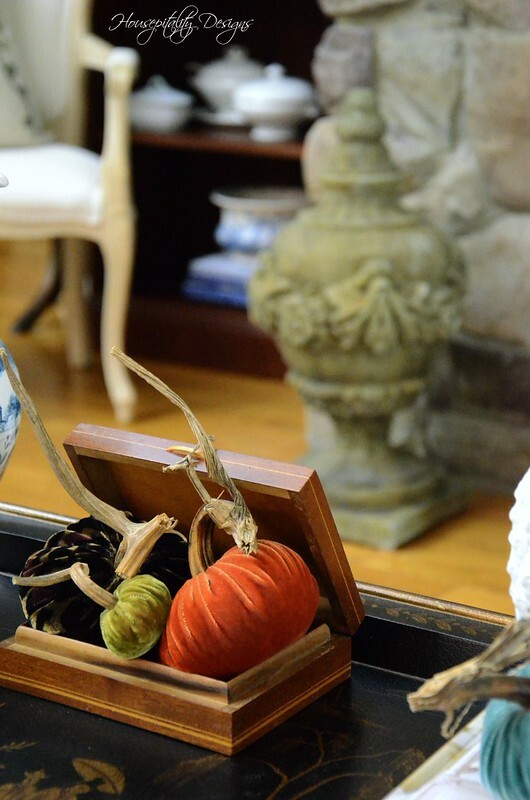 My fav….the little pumpkins in the wood box!!! I’m going to use that idea! Beautifully decorated temporary home! 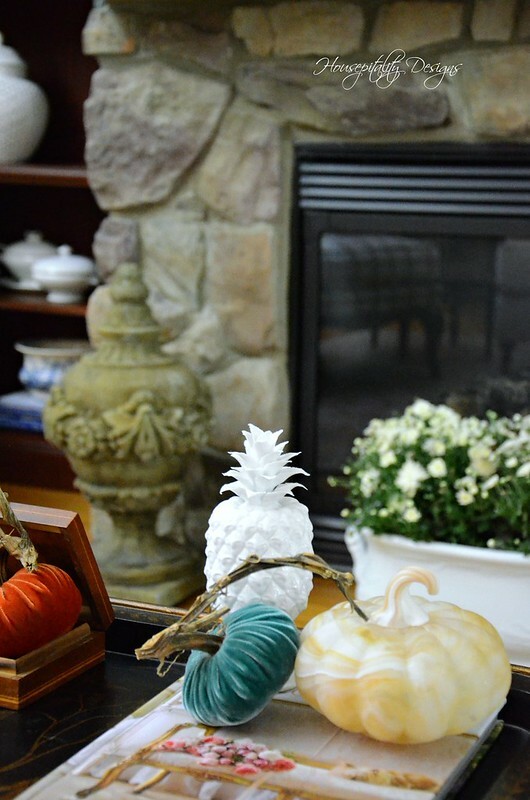 I love seeing familiar pieces from your previous home, such as your pineapples. Congratulations to “the boys”! Beautifully done Shirley! Love the velvet pumpkins. They are pretty and add pops of fall color. 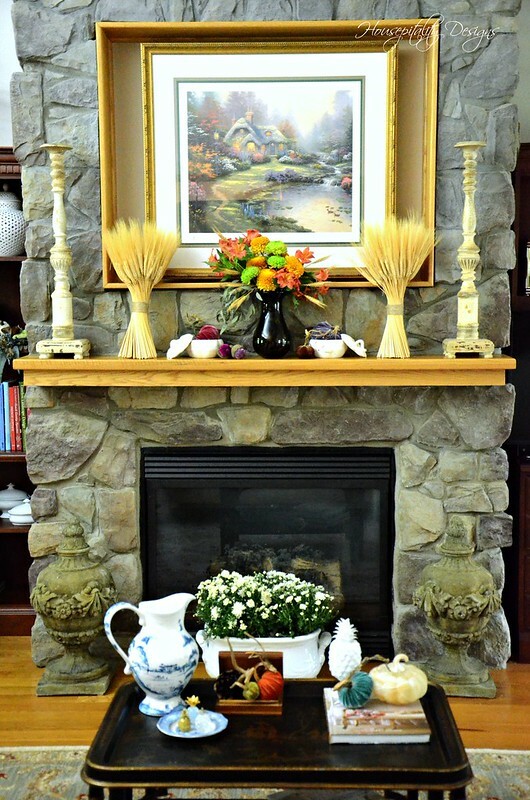 The rustic fireplace is quite a showpiece. I think you are going to enjoy it through the holidays. The inset for the picture is very interesting. I’ve never seen that done before. I hope you’ll be sharing some of the groundbreaking and stages of the new house build! Congratulations on your husband’s baseball team’s great success this year. Definitely a lot to be proud of! Shirley, this does not look like rental living as you are making everything so pretty! Congrats to your hubby and his team! You are making the Berry Patch house truly a home for yourselves. Congrats again to “The Boys of Summer”. I love your plush pumpkins. Love that coffee table in there and love the pumpkins in the box! Have a great weekend. Where is the championship being held and when? You amaze me! When we moved into a rental while we were building a house, I just left everything packed up except the kitchen. We did not decorate or hang a picture. Though we originally thought we would be in our new house in 4 months, it turned out to be 10. 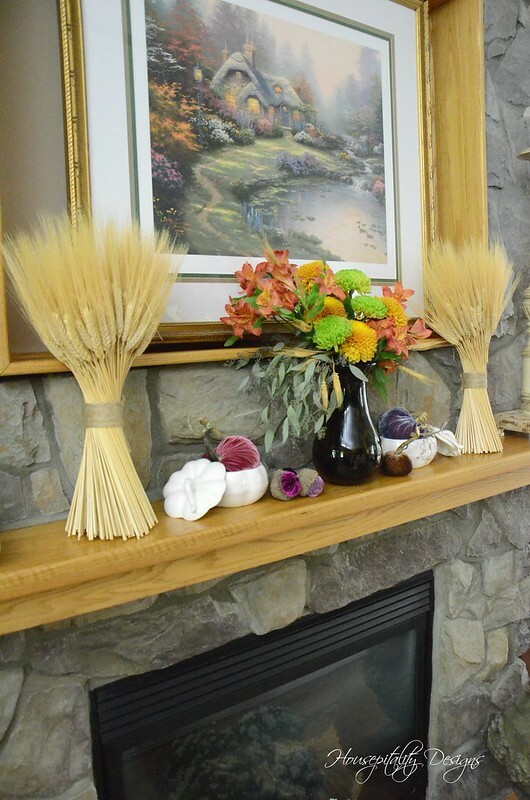 Your great room looks lovely for fall. Shirley, I’m so glad you have a beautiful place to enjoy while your new home is in the works!! The Berry Patch house is lovely, especially with your personal touches. Big congrats to The Boys of Summer! The Berry Patch Home gets more and more enchanting with every one of your magic touches here and there–so pretty, Shirley! Hugs! How you do it, I just don’t know. But you do it like a total pro!!!!!!!!!! Girl…you have this room looking like you’ve lived in this home for years! Like an effortless dance in which you take the lead with grace and style. Beautiful!